Before we commence to showing how ichthyosaurs are frustrating for Darwin's disciples and deep time proponents, I found out that something useful has been reissued. My Charles Darwin Club Secret Decoder Ring™ is kept in a glass case most of the time, but it shows signs of wear. Now trolls and other purveyors of evoporn can all have a new version! Now, down to business. 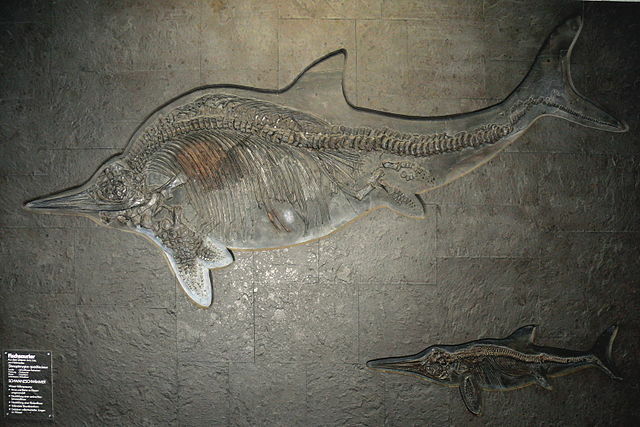 A somewhat baffling critter during dinosaur times was the ichthyosaur, which resembled dolphins and reptiles. There were several different kinds, and their name is Greek for "fish lizard". Dinosaurs had no evolutionary past, and their aquatic pals were also problematic, so instead of admitting that the logical explanation is recent special creation, evolutionists tried to come up with ancestors for ichthyosaurs. 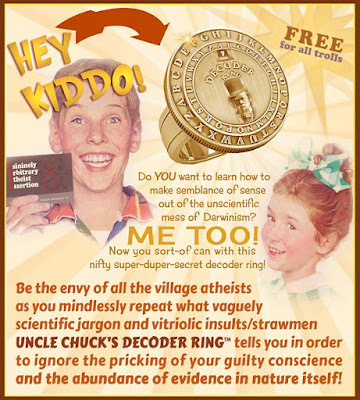 They failed, and not even their decoder rings could help. In reality, ichthyosaurs are examples of the design work of the Master Engineer with their fecundity as well as apparent swimming and hunting abilities. These creatures were rapidly buried. Not in one or two instances, but in various parts of the world — some were buried in the process of giving birth! Yet another clear indication of the global Genesis Flood. One of the earliest complete fossils discovered was Ichthyosaurus, discovered between 1809–1811 by a pair of children in England. While parts of other Ichthyosaurus skeletons had been discovered previously, the English find was the first complete specimen. Since then thousands of ichthyosaur skeletons have been discovered, including numerous complete specimens. These unique creatures have captivated paleontologists for two centuries. They are well studied, and research on their skeletons has provided evidence for incredible design and the global flood. To finish reading, click on "Ichthyosaur: Evidence of Design and the Flood".